AKA: EC47;Mk. 20A;Polaris A-1;UGM-27A. Status: Retired 1968. First Launch: 1959-09-21. Last Launch: 1968-05-01. Number: 106 . Payload: 500 kg (1,100 lb). Thrust: 289.20 kN (65,015 lbf). Gross mass: 12,700 kg (27,900 lb). Height: 8.54 m (28.01 ft). Diameter: 1.37 m (4.49 ft). Span: 1.37 m (4.49 ft). Apogee: 500 km (310 mi). 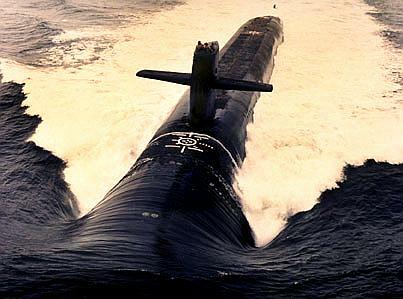 Submarine-launched ballistic missiles were conceived by the Germans in World War II. But their concepts for a towed V-2 launcher seemed too limited, and after some hair-raising tests launching V-2's from aircraft carriers the US Navy decided it wanted no part of liquid propellant rockets aboard ships. Nevertheless they were ordered in 1955 to assist in development of a submarine-launched version of von Braun's Jupiter IRBM. They quickly obtained permission to develop instead a solid propellant �version' of the Jupiter, and then in December 1956 to proceed with development of their own design. Development and production of the entire submarine-launched ballistic missile system � involving new solid rocket motors, miniaturized nuclear weapons, new inertial navigation systems, and new submarines to carry 16 of the missiles � occurred in an unbelievable pace in a crash program. First launch of a test vehicle was in September 1958; the first all-up prototype was launched one year later; the first submerged launch from a submarine on 20 July 1960; and the first operational patrol in November 1960. On 6 May 1962 the Polaris A-1 became the only US long-range missile to fire a live nuclear warhead. The low yield and poor accuracy of the Polaris meant it could only be used as a retaliatory weapon to destroy cities, not to take out hardened military targets. The Polaris A1 was an interim weapon, not meeting the original range requirements. It was quickly succeeded by the Polaris A2 on the production line. Maximum range: 1,900 km (1,100 mi). Number Standard Warheads: 1. Standard RV: Mk. 20A. Standard warhead: EC47. Warhead yield: 600 KT. CEP: 8.06 km (5.00 mi). Boost Propulsion: Solid rocket. Maximum speed: 9,680 kph (6,010 mph). Initial Operational Capability: 1960. The Polaris was the first SLBM (Submarine-Launched Ballistic Missile) deployed by the U.S. Navy. Their inherent immunity to pre-emptive strikes has made SLBMs one of the most important assets of the U.S. nuclear armed forces ever since. Like all U.S. military services, the U.S. Navy experimented with ballistic missiles in the immediate post-war years, mainly by using captured German A-4-V-2 rockets. However, it soon became clear that the hazard involved with liquid-propellant rockets ruled out this technology for shipboard use. In the early 1950s, solid-fuel rocket technology had advanced to a point where long-range missiles would be feasible. In 1955, however, the Navy was ordered to develop a derivative of the liquid-fueled SM-78-PGM-19 Jupiter IRBM as a sea-launched ballistic missile. In early 1956, the Navy was granted permission to develop a solid-fueled Jupiter derivative instead (to be called Jupiter S), and in December 1956, the Navy was finally allowed to drop out of the Jupiter program and develop a completely new solid-fueled ballistic missile. The new program was named Polaris, and development contracts were given to Lockheed (missile) and Aerojet (propulsion). From the beginning, Polaris was planned for launch from submarines. This made the missile effectively undetectable before launch, and had the additional advantage of providing a significantly more stable platform for an inertial navigation system, thereby increasing accuracy. Unlike other U.S. Navy missiles of the time, Polaris didn't receive a formal missile designation (like SSM-N-x or USM-N-x). Instead, the Polaris (and future SLBMs) were known by simple letter-number combinations, starting with A-1 (or A1, as the dash is frequently omitted) for the first Polaris version. Polaris A-1 was significantly smaller and lighter than the proposed Jupiter S, allowing much more missiles to be carried by a submarine of a given size. Because starting a rocket motor inside a submarine was considered too dangerous, a so-called "cold launch" method was developed, where the missile is ejected from the vertical launch tube by gas pressure before the motor is ignited. The first launch of a Polaris AX test vehicle in September 1958 was unsuccessful, and the first fully successful flight only occurred in April 1959, after 5 other failures. In September 1959, the first Polaris A-1X tactical prototype missile, which included the inertial navigation system, was successfully launched, and tests of the A-1X continued through 1960. In the meantime, the Navy had built its first ballistic missile submarine, the USS George Washington (SSBN-598), by fitting an existing SSN, the USS Scorpion (SSN-589), with a completely new center section with 16 missile launch tubes. The first successful underwater launch of a Polaris missile was accomplished by this ship on 20 July 1960, and in November 1960, the Polaris A-1 SLBM became operational on SSBN-598. On 6 May 1962, USS Ethan Allen (SSBN-608) successfully launched a Polaris A-1 with a live nuclear warhead in the United States' nuclear test range in the Pacific. This was the first and only full live test of a U.S. strategic missile. The Polaris A-1 was powered by a two-stage solid-propellant rocket motor by Aerojet General, both stages using four nozzles with thrust-vectoring for flight control. Its inertial navigation system (designed by MIT, manufactured by General Electric and Hughes) guided the missile to an accuracy of about 900 m (3000 ft) CEP at a maximum range of 2200 km (1200 nm). This poor accuracy, coupled with a relatively low-yield W-47 (600 kT) thermonuclear warhead, made the Polaris unsuitable for strikes against hardened strategic targets. However, because the SLBM force could not effectively taken out by the enemy, it was the ideal retaliation weapon, and therefore very important for the Cold War concept of MAD (Mutually Assured Destruction). Family: submarine-launched. Country: USA. Launch Sites: Cape Canaveral, San Clemente, Cape Canaveral LC25A, Cape Canaveral LC25B, Cape Canaveral LC29A, Vandenberg WTR, Cape Canaveral ETR. Stages: A1P-1, A1P-2. Agency: Lockheed. 1956 December 17 - . LV Family: Polaris. Launch Vehicle: Polaris A1. Polaris project begun. - . Nation: USA. Navy Special Projects Office authorized Lockheed to proceed with Polaris development, having withdrawn from the Jupiter program earlier..
1959 September 21 - . Launch Site: Cape Canaveral. Launch Complex: Cape Canaveral LC29A. LV Family: Polaris. Launch Vehicle: Polaris A1. 1959 October 12 - . 18:18 GMT - . Launch Site: Cape Canaveral. Launch Complex: Cape Canaveral LC29A. LV Family: Polaris. Launch Vehicle: Polaris A1. FAILURE: Failure. 1959 November 20 - . 17:11 GMT - . Launch Site: Cape Canaveral. Launch Complex: Cape Canaveral LC29A. LV Family: Polaris. Launch Vehicle: Polaris A1. 1959 December 7 - . 20:13 GMT - . Launch Site: Cape Canaveral. Launch Complex: Cape Canaveral LC29A. LV Family: Polaris. Launch Vehicle: Polaris A1. 1959 December 16 - . 04:50 GMT - . Launch Site: Cape Canaveral. Launch Complex: Cape Canaveral LC29A. LV Family: Polaris. Launch Vehicle: Polaris A1. FAILURE: Failure. 1959 December 23 - . Launch Site: Cape Canaveral. Launch Complex: Cape Canaveral LC25B. LV Family: Polaris. Launch Vehicle: Polaris A1. FAILURE: Failure. 1960 January 8 - . Launch Site: Cape Canaveral. Launch Complex: Cape Canaveral LC29A. LV Family: Polaris. Launch Vehicle: Polaris A1. Inertial test - . Nation: USA. Agency: USN. Apogee: 500 km (310 mi). 1960 January 13 - . 21:07 GMT - . Launch Site: Cape Canaveral. Launch Complex: Cape Canaveral LC29A. LV Family: Polaris. Launch Vehicle: Polaris A1. 1960 January 20 - . Launch Site: Cape Canaveral. Launch Complex: Cape Canaveral LC29A. LV Family: Polaris. Launch Vehicle: Polaris A1. 1960 January 27 - . Launch Site: Cape Canaveral. Launch Complex: Cape Canaveral LC29A. LV Family: Polaris. Launch Vehicle: Polaris A1. 1960 February 4 - . 22:19 GMT - . Launch Site: Cape Canaveral. Launch Complex: Cape Canaveral LC29A. LV Family: Polaris. Launch Vehicle: Polaris A1. 1960 February 10 - . Launch Site: Cape Canaveral. Launch Complex: Cape Canaveral LC29A. LV Family: Polaris. Launch Vehicle: Polaris A1. 1960 February 26 - . Launch Site: Cape Canaveral. Launch Complex: Cape Canaveral LC29A. LV Family: Polaris. Launch Vehicle: Polaris A1. FAILURE: Failure. 1960 March 9 - . Launch Site: Cape Canaveral. Launch Complex: Cape Canaveral LC25A. LV Family: Polaris. Launch Vehicle: Polaris A1. 1960 March 18 - . Launch Site: Cape Canaveral. Launch Complex: Cape Canaveral LC25B. LV Family: Polaris. Launch Vehicle: Polaris A1. 1960 March 25 - . Launch Site: Cape Canaveral. Launch Complex: Cape Canaveral LC25B. LV Family: Polaris. Launch Vehicle: Polaris A1. 1960 March 29 - . Launch Site: Cape Canaveral. Launch Complex: Cape Canaveral ETR. Launch Platform: EAG-154. LV Family: Polaris. Launch Vehicle: Polaris A1. FAILURE: Failure. Integrated test - . Nation: USA. Agency: USN. Apogee: 300 km (180 mi). 1960 April 14 - . 22:21 GMT - . Launch Site: San Clemente. LV Family: Polaris. Launch Vehicle: Polaris A1. Underwater test - . Nation: USA. Agency: USN. Apogee: 1.00 km (0.60 mi). 1960 April 18 - . Launch Site: Cape Canaveral. Launch Complex: Cape Canaveral ETR. Launch Platform: EAG-154. LV Family: Polaris. Launch Vehicle: Polaris A1. FAILURE: Failure. 1960 April 26 - . 01:13 GMT - . Launch Site: Cape Canaveral. Launch Complex: Cape Canaveral LC29A. LV Family: Polaris. Launch Vehicle: Polaris A1. 1960 April 29 - . 23:45 GMT - . Launch Site: Cape Canaveral. Launch Complex: Cape Canaveral LC29A. LV Family: Polaris. Launch Vehicle: Polaris A1. 1960 April 30 - . 03:45 GMT - . Launch Site: Cape Canaveral. Launch Complex: Cape Canaveral LC25A. LV Family: Polaris. Launch Vehicle: Polaris A1. 1960 May 18 - . Launch Site: Cape Canaveral. Launch Complex: Cape Canaveral LC25B. LV Family: Polaris. Launch Vehicle: Polaris A1. 1960 May 23 - . Launch Site: Cape Canaveral. Launch Complex: Cape Canaveral ETR. Launch Platform: EAG-154. LV Family: Polaris. Launch Vehicle: Polaris A1. 1960 June 7 - . Launch Site: Cape Canaveral. Launch Complex: Cape Canaveral LC25A. LV Family: Polaris. Launch Vehicle: Polaris A1. FAILURE: Failure. 1960 June 23 - . 02:22 GMT - . Launch Site: Cape Canaveral. Launch Complex: Cape Canaveral ETR. Launch Platform: EAG-154. LV Family: Polaris. Launch Vehicle: Polaris A1. 1960 June 23 - . 05:52 GMT - . Launch Site: Cape Canaveral. Launch Complex: Cape Canaveral LC25B. LV Family: Polaris. Launch Vehicle: Polaris A1. 1960 June 30 - . Launch Site: San Clemente. LV Family: Polaris. Launch Vehicle: Polaris A1. 1960 July 6 - . 15:55 GMT - . Launch Site: Cape Canaveral. Launch Complex: Cape Canaveral LC25A. LV Family: Polaris. Launch Vehicle: Polaris A1. FAILURE: Failure. 1960 July 7 - . Launch Site: Cape Canaveral. Launch Complex: Cape Canaveral ETR. Launch Platform: EAG-154. LV Family: Polaris. Launch Vehicle: Polaris A1. FAILURE: Failure. Test mission - . Nation: USA. Agency: USN. Apogee: 0 km (0 mi). 1960 July 15 - . 06:10 GMT - . Launch Site: Cape Canaveral. Launch Complex: Cape Canaveral LC25B. LV Family: Polaris. Launch Vehicle: Polaris A1. 1960 July 19 - . 16:00 GMT - . Launch Site: Cape Canaveral. Launch Complex: Cape Canaveral LC25A. LV Family: Polaris. Launch Vehicle: Polaris A1. 1960 July 20 - . 17:39 GMT - . Launch Site: Cape Canaveral. Launch Complex: Cape Canaveral ETR. Launch Platform: SSBN 598. LV Family: Polaris. Launch Vehicle: Polaris A1. 1960 July 20 - . 20:34 GMT - . Launch Site: Cape Canaveral. Launch Complex: Cape Canaveral ETR. Launch Platform: SSBN 598. LV Family: Polaris. Launch Vehicle: Polaris A1. 1960 July 30 - . 20:20 GMT - . Launch Site: Cape Canaveral. Launch Complex: Cape Canaveral ETR. Launch Platform: SSBN 598. LV Family: Polaris. Launch Vehicle: Polaris A1. 1960 August 1 - . 17:10 GMT - . Launch Site: Cape Canaveral. Launch Complex: Cape Canaveral ETR. Launch Platform: SSBN 598. LV Family: Polaris. Launch Vehicle: Polaris A1. FAILURE: Failure. 1960 August 3 - . 00:58 GMT - . Launch Site: Cape Canaveral. Launch Complex: Cape Canaveral LC25B. LV Family: Polaris. Launch Vehicle: Polaris A1. 1960 August 4 - . Launch Site: Cape Canaveral. Launch Complex: Cape Canaveral LC25A. LV Family: Polaris. Launch Vehicle: Polaris A1. 1960 August 12 - . 18:28 GMT - . Launch Site: Cape Canaveral. Launch Complex: Cape Canaveral LC25A. LV Family: Polaris. Launch Vehicle: Polaris A1. 1960 August 19 - . 03:20 GMT - . Launch Site: Cape Canaveral. Launch Complex: Cape Canaveral LC25A. LV Family: Polaris. Launch Vehicle: Polaris A1. 1960 August 24 - . 20:43 GMT - . Launch Site: San Clemente. LV Family: Polaris. Launch Vehicle: Polaris A1. 1960 September 2 - . Launch Site: Cape Canaveral. Launch Complex: Cape Canaveral LC25A. LV Family: Polaris. Launch Vehicle: Polaris A1. 1960 September 13 - . 17:55 GMT - . Launch Site: Cape Canaveral. Launch Complex: Cape Canaveral ETR. Launch Platform: SSBN 599. LV Family: Polaris. Launch Vehicle: Polaris A1. FAILURE: Failure. 1960 September 15 - . 21:28 GMT - . Launch Site: Cape Canaveral. Launch Complex: Cape Canaveral ETR. Launch Platform: SSBN 599. LV Family: Polaris. Launch Vehicle: Polaris A1. 1960 September 22 - . 22:05 GMT - . Launch Site: Cape Canaveral. Launch Complex: Cape Canaveral ETR. Launch Platform: SSBN 599. LV Family: Polaris. Launch Vehicle: Polaris A1. FAILURE: Failure. 1960 September 23 - . Launch Site: Cape Canaveral. Launch Complex: Cape Canaveral LC25A. LV Family: Polaris. Launch Vehicle: Polaris A1. 1960 September 23 - . 01:05 GMT - . Launch Site: Cape Canaveral. Launch Complex: Cape Canaveral ETR. Launch Platform: SSBN 599. LV Family: Polaris. Launch Vehicle: Polaris A1. FAILURE: Failure. 1960 October 5 - . 16:04 GMT - . Launch Site: Cape Canaveral. Launch Complex: Cape Canaveral LC25A. LV Family: Polaris. Launch Vehicle: Polaris A1. 1960 October 10 - . Launch Site: Cape Canaveral. Launch Complex: Cape Canaveral LC25A. LV Family: Polaris. Launch Vehicle: Polaris A1. 1960 October 15 - . Launch Site: Cape Canaveral. Launch Complex: Cape Canaveral ETR. Launch Pad: 500NM. Launch Platform: SSBN 599. LV Family: Polaris. Launch Vehicle: Polaris A1. Operational test - . Nation: USA. Agency: USN. Apogee: 500 km (310 mi). 1960 October 16 - . Launch Site: Cape Canaveral. Launch Complex: Cape Canaveral ETR. Launch Pad: 500NM. Launch Platform: SSBN 599. LV Family: Polaris. Launch Vehicle: Polaris A1. 1960 October 18 - . Launch Site: Cape Canaveral. Launch Complex: Cape Canaveral ETR. Launch Pad: 500NM. Launch Platform: SSBN 599. LV Family: Polaris. Launch Vehicle: Polaris A1. 1960 November 7 - . 19:00 GMT - . Launch Site: Cape Canaveral. Launch Complex: Cape Canaveral LC25A. LV Family: Polaris. Launch Vehicle: Polaris A1. 1960 November 17 - . 19:00 GMT - . Launch Site: Cape Canaveral. Launch Complex: Cape Canaveral LC25A. LV Family: Polaris. Launch Vehicle: Polaris A1. FAILURE: Failure. 1960 December 22 - . 18:34 GMT - . Launch Site: Cape Canaveral. Launch Complex: Cape Canaveral ETR. Launch Platform: SSBN 601. LV Family: Polaris. Launch Vehicle: Polaris A1. 1961 January 11 - . 18:40 GMT - . Launch Site: Cape Canaveral. Launch Complex: Cape Canaveral ETR. Launch Platform: SSBN 601. LV Family: Polaris. Launch Vehicle: Polaris A1. FAILURE: Failure. Operational test - . Nation: USA. Agency: USN. Apogee: 20 km (12 mi). 1961 January 14 - . Launch Site: Cape Canaveral. Launch Complex: Cape Canaveral ETR. Launch Platform: SSBN 601. LV Family: Polaris. Launch Vehicle: Polaris A1. FAILURE: Failure. 1961 March 23 - . 16:25 GMT - . Launch Site: Cape Canaveral. Launch Complex: Cape Canaveral ETR. Launch Platform: SSBN 600. LV Family: Polaris. Launch Vehicle: Polaris A1. FAILURE: Failure. 1961 March 23 - . 19:25 GMT - . Launch Site: Cape Canaveral. Launch Complex: Cape Canaveral ETR. Launch Platform: SSBN 600. LV Family: Polaris. Launch Vehicle: Polaris A1. 1961 March 23 - . 22:41 GMT - . Launch Site: Cape Canaveral. Launch Complex: Cape Canaveral ETR. Launch Platform: SSBN 600. LV Family: Polaris. Launch Vehicle: Polaris A1. FAILURE: Failure. 1961 April 6 - . Launch Site: Cape Canaveral. Launch Complex: Cape Canaveral ETR. Launch Platform: SSBN 600. LV Family: Polaris. Launch Vehicle: Polaris A1. 1961 April 19 - . Launch Site: Cape Canaveral. Launch Complex: Cape Canaveral ETR. Launch Platform: SSBN 601. LV Family: Polaris. Launch Vehicle: Polaris A1. 1961 May 3 - . 17:00 GMT - . Launch Site: Cape Canaveral. Launch Complex: Cape Canaveral ETR. Launch Platform: SSBN 602. LV Family: Polaris. Launch Vehicle: Polaris A1. 1961 May 17 - . Launch Site: Cape Canaveral. Launch Complex: Cape Canaveral ETR. Launch Platform: SSBN 602. LV Family: Polaris. Launch Vehicle: Polaris A1. 1961 August 12 - . Launch Site: Cape Canaveral. Launch Complex: Cape Canaveral ETR. Launch Platform: SSBN 602. LV Family: Polaris. Launch Vehicle: Polaris A1. 1961 September 29 - . 14:00 GMT - . Launch Site: Cape Canaveral. Launch Complex: Cape Canaveral LC25A. LV Family: Polaris. Launch Vehicle: Polaris A1. 1961 October 16 - . 14:54 GMT - . Launch Site: Cape Canaveral. Launch Complex: Cape Canaveral ETR. Launch Platform: SSBN 608. LV Family: Polaris. Launch Vehicle: Polaris A1. 1961 November 3 - . 14:01 GMT - . Launch Site: Cape Canaveral. Launch Complex: Cape Canaveral ETR. Launch Platform: SSBN 608. LV Family: Polaris. Launch Vehicle: Polaris A1. Nation: USA. Agency: USN. Apogee: 500 km (310 mi). Three Polaris A-2 missiles successfully fired within 3-hour period from submarine Ethan Allen..
1961 November 3 - . 15:30 GMT - . Launch Site: Cape Canaveral. Launch Complex: Cape Canaveral ETR. Launch Platform: SSBN 608. LV Family: Polaris. Launch Vehicle: Polaris A1. 1961 November 3 - . 17:00 GMT - . Launch Site: Cape Canaveral. Launch Complex: Cape Canaveral ETR. Launch Platform: SSBN 608. LV Family: Polaris. Launch Vehicle: Polaris A1. 1961 December 5 - . Launch Site: Cape Canaveral. Launch Complex: Cape Canaveral LC25A. LV Family: Polaris. Launch Vehicle: Polaris A1. 1962 May 6 - . 23:17 GMT - . Launch Pad: Pacific Ocean, 12.5 N x 134.0 W. Launch Platform: SSBN 608. LV Family: Polaris. Launch Vehicle: Polaris A1. FRIGATE BIRD Nuclear test - . Nation: USA. Agency: USN. Apogee: 500 km (310 mi). The only US test of an operational ballistic missile with a live 600 kiloton warhead. A Polaris A2 missile was launched from the ballistic missile submarine Ethan Allen (SSBN-608) 2800 km east-northeast of Christmas Island. The re-entry vehicle reached the target zone 1890 km away and detonated at 3,300 m. The resulting mushroom cloud was observed by the submarines Carbonero (SS-337) and Medregal (SS-480), both stationed within 25 km of the predicted impact point. 1962 July 27 - . Launch Site: Cape Canaveral. Launch Complex: Cape Canaveral ETR. Launch Platform: SSBN 598. LV Family: Polaris. Launch Vehicle: Polaris A1. 1962 September 14 - . Launch Site: Cape Canaveral. Launch Complex: Cape Canaveral ETR. Launch Platform: EAG-154. LV Family: Polaris. Launch Vehicle: Polaris A1. 1962 September 15 - . Launch Site: Cape Canaveral. Launch Complex: Cape Canaveral ETR. Launch Platform: EAG-154. LV Family: Polaris. Launch Vehicle: Polaris A1. 1962 October 14 - . Launch Site: Cape Canaveral. Launch Complex: Cape Canaveral ETR. Launch Platform: EAG-154. LV Family: Polaris. Launch Vehicle: Polaris A1. 1962 October 14 - . Launch Site: Cape Canaveral. Launch Complex: Cape Canaveral ETR. Launch Platform: EAG-154. LV Family: Polaris. Launch Vehicle: Polaris A1. FAILURE: Failure. 1963 September 4 - . Launch Site: Cape Canaveral. Launch Complex: Cape Canaveral ETR. Launch Platform: SSBN 602. LV Family: Polaris. Launch Vehicle: Polaris A1. 1965 April 14 - . 06:09 GMT - . Launch Site: Cape Canaveral. Launch Complex: Cape Canaveral LC29A. LV Family: Polaris. Launch Vehicle: Polaris A1. FAILURE: Failure. STAFF 1 test - . Nation: USA. Agency: USN. Apogee: 1.00 km (0.60 mi). 1965 June 16 - . 13:56 GMT - . Launch Site: Cape Canaveral. Launch Complex: Cape Canaveral LC29A. LV Family: Polaris. Launch Vehicle: Polaris A1. STAFF 2 test - . Nation: USA. Agency: USN. Apogee: 650 km (400 mi). 1965 August 11 - . Launch Site: Cape Canaveral. Launch Complex: Cape Canaveral LC29A. LV Family: Polaris. Launch Vehicle: Polaris A1. STAFF 3 test - . Nation: USA. Agency: USN. Apogee: 500 km (310 mi). 1965 November 12 - . 22:28 GMT - . Launch Site: Cape Canaveral. Launch Complex: Cape Canaveral LC29A. LV Family: Polaris. Launch Vehicle: Polaris A1. STAFF 4 test - . Nation: USA. Agency: USN. Apogee: 500 km (310 mi). 1967 - . Launch Site: Johnston Island. Launch Pad: SLBM Launch Area. Launch Platform: EAG-154. LV Family: Polaris. Launch Vehicle: Polaris A1. ISEP 3 Mk 2 RV - . Nation: USA. Agency: USN. Apogee: 500 km (310 mi). ISEP 2 Mk 2 RV - . Nation: USA. Agency: USN. Apogee: 500 km (310 mi). ISEP 1 Mk 2 RV - . Nation: USA. Agency: USN. Apogee: 500 km (310 mi). 1968 - . Launch Site: Vandenberg. Launch Complex: Vandenberg WTR. Launch Platform: EAG-154. LV Family: Polaris. Launch Vehicle: Polaris A1. ISEP 6 Mk 2 RV - . Nation: USA. Agency: USN. Apogee: 500 km (310 mi). 1968 May? - . Launch Site: Johnston Island. Launch Pad: SLBM Launch Area. Launch Platform: EAG-154. LV Family: Polaris. Launch Vehicle: Polaris A1. ISEP 4 Mk 2 RV - . Nation: USA. Agency: USN. Apogee: 500 km (310 mi). ISEP 5 Mk 2 RV - . Nation: USA. Agency: USN. Apogee: 100 km (60 mi).